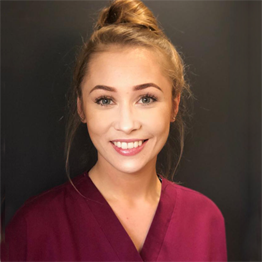 Maya is a Dental Hygiene Therapist who gained her qualification at the University of Leeds in 2018. At her time in Leeds, Maya treated patients ranging from as young 4-year-old children in economically and socially deprived areas to patients in hospital settings with advanced periodontal disease. Maya's primary focus when it comes to oral health care is prevention – gum disease is a silent disease and most people don't know they have it until it's in its later stages. Maya works hard with patients and strives to reach the best possible end result for all of her patients. In her spare time, Maya enjoys keeping active by lifting weights and taking her dog for runs together. Maya also enjoys crime and thriller-based novels.